S uccessful organizations adapt. They acquire, merge, split, enter new markets, adopt new business models, discard old ethos, and sometimes change their very DNA. This isn’t easy—Aligning people, processes, and technology with every change in business strategy requires nimbleness that very few possess, and fewer still excel in. Enterprise Transformation fundamentally changes the way an organization operates, many times in unforeseen ways—which is why you need a partner who understands the nuances of this process and can accurately map its impact and has the expertise to carry it out. At Nagarro, we have a pool of Transmod experts who leverage our unique Assess-Renovate-Transform (ART) methodology to deep dive into your IT landscape. We shall quickly assess your current application portfolio for modernization feasibility and formulate a detailed roadmap for transformation. We ensure successful Java migrations by combining our unique migration methodology, accelerators (including our proprietary jMod solution), and partnerships with leading Java tool vendors. We offer comprehensive, end-to-end SharePoint modernization solution which includes Rapid Assessment and Office 365 migration helps companies maximize the return on their SharePoint investments, lower TCO, and increase user engagement with the platform. Legacy systems are a reality of enterprise IT infrastructure. Staying competitive necessitates integrating the legacy assets with newer technologies or transitioning to modern, open systems. We are backed by a team of experts who provide you with a comprehensive multi-option TCO reduction strategy, but more importantly help you assess the cost, performance, and risk implications of each decision. 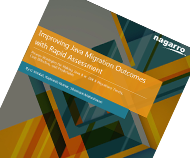 Improving Java Migration Outcomes with Rapid AssessmentGet Proven Strategies for Making Java 8 or JDK 8 Migrations Timely, Cost-Effective, and Predictable.